All Found Objects: Shelf, tile samples, floor samples, glass lamp shade, water samples (labelled – ocean, river, lake, waterfall) in assorted found bottles, earth and seed samples in glass vials, piece of marble, shard of glass, photographs, compact mirror filled with red sand, cactus and succulent. A. I have been based in San Francisco since January 2012, after moving from London to study at SFAI. My work has always looked to California for its subject matter and up until I moved here, it had always been focused in painting and collage. On being placed directly within the environment I am so fascinated by, I began to work with found materials, as I found myself being able to play with the physical aspects of California as opposed to just a 2D representation of it. The work is concerned with ideas of façade and the boundaries between the real and simulated that we are presented with on a mundane level everyday. 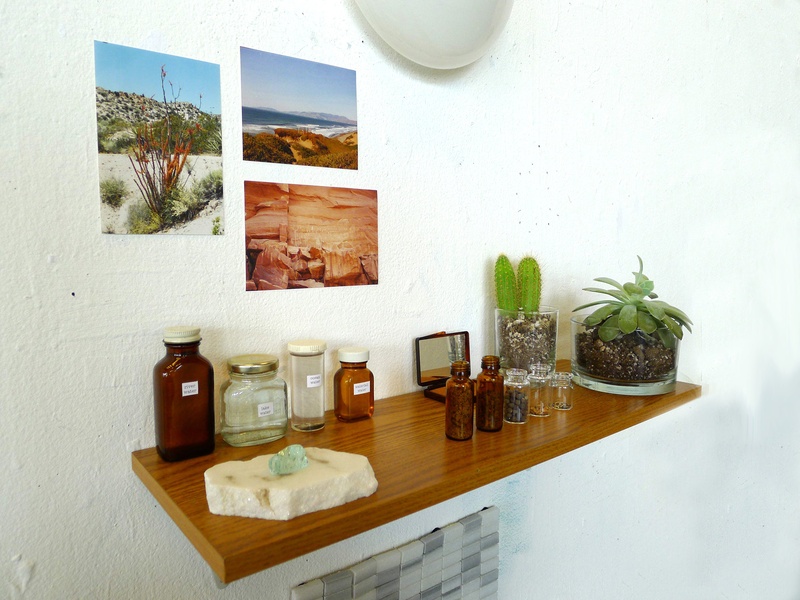 The installation shown in the photographs is a faux domestic set-up in which common domestic tropes are juxtaposed with natural materials sourced from the state of California. The shelving unit, tile samples and wood laminate flooring are all simulations of the natural environment, while the water samples from ocean, river, lake and waterfall as well as the earth and seed samples, are genuine extractions from the natural environment. There are then real plants native to California, yet they have been grown specifically for domestic use, while the found photographs show representations of the Californian landscape and plants in their natural habitat. It is this complex web of references that I am interested in evoking within my work, and I hope that somewhere within the thought process of the viewer, the idea of what we accept as being ‘real’ blurs to the point that it becomes a myth. A. My advice to other artists both studying and working, is to never give yourself a break. Do not be satisfied with your day unless you have spent time in the studio, writing down your ideas, staring off into space in thought, or exploring new artists and galleries. As soon as your eye is off the ball your artistic process starts to slow and go stale. So don’t waste time, keep yourself fresh!